Tropical Storm Colin broke the record of the earliest third named storm within the Atlantic basin by seven days. The previous record was set in 1887. Colin developed from a low pressure area over the Gulf of Mexico near the northern coast of the Yucatán Peninsula late on June 5. On June 6, Colin curved to the north-northeast and picked up speed. Sanibel and Captiva experienced the greatest impact from Colin on June 6th and Colin passed approximately 320 miles west of the islands. The strongest winds from Colin experienced locally occurred between the morning of June 6th and the evening of the 7th. 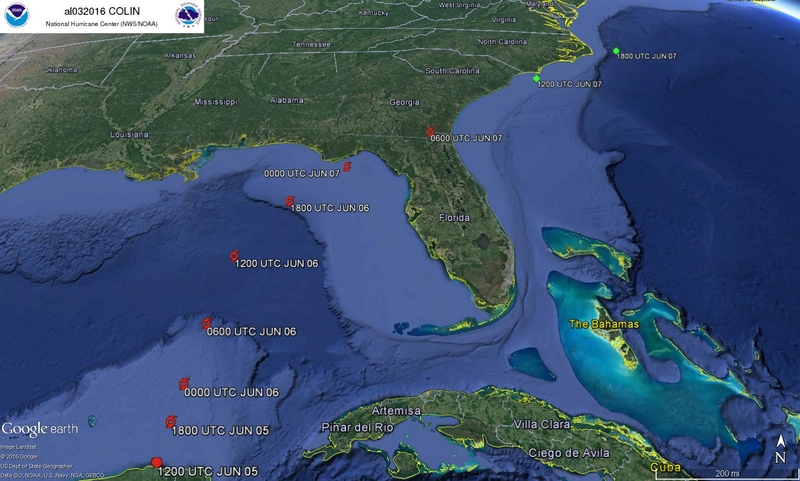 Sustained wind of 25 to 30 miles per hour were recorded at the Gulf of Mexico RECON site. Similar to previous tropical storms the sustained unidirectional winds from Colin pushed water from the Gulf of Mexico up into the Caloosahatchee River. The water depth at the Shell Point site increased slightly and the salinity level was held somewhat higher. As the storm ended the salinity level came down lower then its pre storm level. This drop in salinity can be attributed to local rainfall from the storm and an increase in discharge from the W.P. Franklin Lock (S79). Tropical Storm Colin was the first tropical storm to impact our area since the establishment of the RECON wave buoy. Wave heights of over 10 feet were recorded on June 6th.The beaches of Sanibel and Captiva are used by several species of sea turtle for nesting. The beaches are monitored for nesting as part of SCCF's Sea Turtle Program. The waves caused significant coastal erosion and the loss of 59 sea turtle nests on Sanibel and Captiva.